1. Trim the broccoli stalks, then slice off the buds with a little stem and reserve (halve these lengthwise if they’re plump). Finely dice the remaining stalks. 2. 2 Melt 15g butter in a large saucepan over a low-medium heat. Add the shallots and cook gently for 5 minutes until soft, but not coloured. Add the garlic and cook for a further minute. Add the rice and cook, stirring to coat in the butter, for a few minutes more. Add the wine and simmer until reduced to almost nothing. Meanwhile, heat the stock in a separate, large pan, turn down to a very gentle simmer, then add the diced broccoli stalks. 3. Add a ladle of hot stock and stalks to the rice, stirring until the liquid has almost disappeared. Keep on adding hot stock and stirring for about 12-14 minutes. 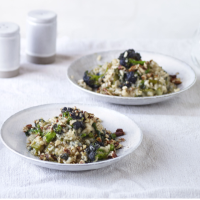 At this point, add the reserved broccoli buds to the risotto and continue to cook, adding stock as before, for a further 4-6 minutes, until the rice grains are cooked, but still retain their shape and a bit of bite in the centre. 4. Remove from the heat and stir in the remaining 15g butter. Cover with a lid and set aside for 5 minutes. Stir 2 /3 of the gorgonzola through the risotto and divide between shallow serving bowls or plates. Top with the remaining cheese and the toasted pecans.